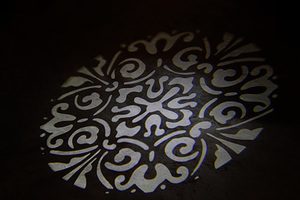 Add some design and texture to your lighting decor with a few of these gobo lights loaded up with this lovely floral pattern (see photo). Very easy to use - just plug the light in, and adjust the focus. You can hang them from a lighting stand or trussing (not included), or simply place them on a table to project on a wall. The further back you place the light, the bigger the image! 1) This only comes in white. Mix this effect with some Uplighting to add in color.